Betty Huf addressing the Tour Group at the Hempel farm. Home » News and Events » Past Events » Tabor Church Building Centenary Celebration Weekend, 10-12 March 2012. March 10, 2012 by John Noack, based on tour notes prepared by Betty Huf and on useful literature listed below The annual Wendish Country Tour during Victoria's long weekend in March allows our Society's members and their friends to spend three days soaking up and learning about the various noteworthy historical and heritage sites in the area. 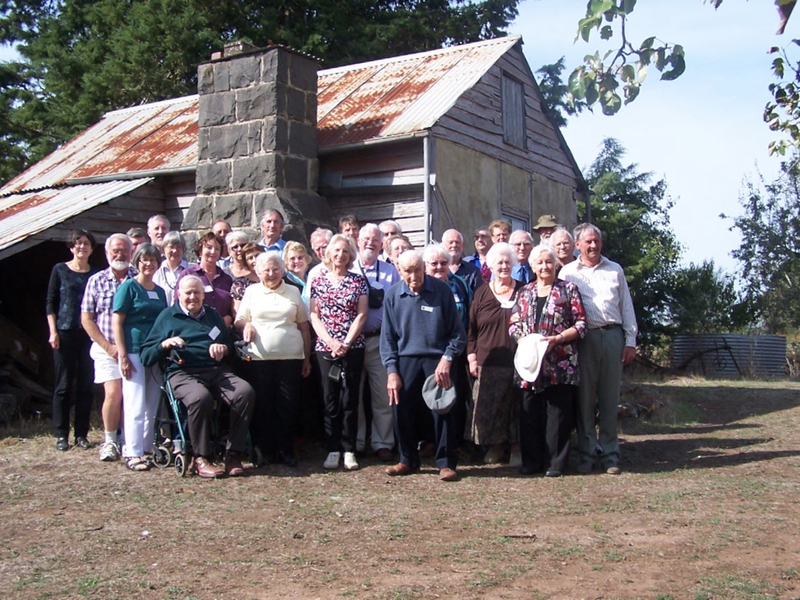 The Tabor Lutheran congregation celebrated the centenary of its church building at 10am on 11 March but before this event, tour participants were able to spend the Saturday at Penshurst climbing Mt Rouse and attending the Tabor concert; Sunday at Tabor and Gnadenthal and Monday touring Hamilton, including Good Shepherd College and the South Hamilton Cemetery. Volcanoes at Penshurst Our visit to Penshurst included an afternoon focusing on volcanoes. The Penshurst Volcanoes Discovery Centre is located in the former Mount Rouse Shire Offices and was opened in 2003 in order to inform people about this area's former volcanic activity. We soon learned that Mt Rouse was formed by volcanic eruption about 350,000 years ago and that it expelled flowing larva, which later became bluestone and larva blown into the air, which became aerated scoria rock. Solid chunks of air-born larva are called bullets. Audio-visual presentations depicted clearly the large area affected by volcanic activity which is part of the Kanawinka Global Geo-park of South West Victoria and South East South Australia, stretching all the way from Millicent to Colac. Such a display of volcanic activity leads to the almost obligatory ascent of Mount Rouse, which is a massive accumulation of air-borne scoria which rises 100 metres above the surrounding volcanic plain. All of the touring party made it to the top and we took photographs to record this achievement. There was a good view of the surrounding landscape and the deep circular crater and lake rimmed with basalt. Photos were also taken of the volcanic layers of sediments, which have been exposed in the nearby Council quarry. Talent and Traditions at Tabor Tabor's Concert on Saturday evening at 8pm was held in the Church Hall. Trevor Linke welcomed everybody and the Tabor Talent for entertaining was revealed in the musical items presented by the Tabor Male Choir with its version of the famous "Schnitzelbank", by Gavin and Tegan Fry and by others, as well as in the dramatic plays and skits relating to Basil the Rat, Two Hause Fraus and other items. The Centenary Service was held in the church at 10 am on Sunday 11 March, with Pastor Bill Fry as the liturgist, Dr Mike Semmler as the Preacher, Gavin Fry as the Organist and long-serving Vallance Huf as the Choir Conductor, along with others who took part in readings and playing musical instruments. The hymn before the sermon "For many years" was also sung at the building's Dedication Service in 1912. The service booklet also contained photos of the church's early stages of construction and the history of the three church buildings at Tabor. The first church was built on land bought from Johann Mibus and was dedicated by Pastor C.W.Schurmann in 1861. The second was dedicated on 10 July 1884 and is still standing. The third and present church was built according to plans prepared by Architect Mr Frank Hammond. Blue-stone rock was carted from Andreas Rentsch's property and sand from Caroline Matuschka's property. The freestone was brought from Mt Abrupt by bullock wagons. The Dedication took place on Thursday 7 March 1912 and the Pastors present were O Nichterlein, E. Kriewaldt, J. Darsow and Professor Koch. The building was designed in the 13th century English Gothic Style and a noteworthy feature is its stained glass windows depicting Peter, Paul and Christ as the Light of the World, based on the famous painting by Holman Hunt. Some Members financed and presented various items of furniture and utensils. This Centenary Celebration is clear evidence of Tabor's respect and concern for its traditions and its pioneering heritage, which included such early Germanic and Wendish families as Gardi, Lehrack, Matuschka, Mudra, Nowotna, Rentsch, Scheetz, Starick, and Zschech. Gnadenthal or Valley of Grace The touring party, which had come to Tabor on the bus, continued on to Gnadenthal and its well kept cemetery and grave-sites. This area was located between the township of Penshurst in the East, where the families could purchase their required house-hold goods and the church at Tabor in the West, where they could attend church services after using their homes for services until 1861. This area's pioneering families included the Alberts, Bieschkes, Burgers, Mirtschins, Stephans and Urbans. Some local Gnadenthal farms were the next destination. The Mirtschins displayed for us their very old wooden trunk and wooden wheelbarrow and the Burgers made us welcome at their 1853 Burger Cottage, which contains family items and books used back in the pioneering days. Hamilton's Heritage Tours through Europe are often called "ABC Tours", because they feature either "Another Beautiful Cathedral" or in a less complimentary description, "Another B.... Castle". Hamilton also has its own "ABC Tour": Ansett Airways Museum, a Burial Ground of great historical interest and the Churches of St Michael's and St Luke's, which reveal much about the experiences of this area's early pioneering settlers. Ansett Airways, which began its story when Reginald Ansett, on 5 Dec 1931, drove his Studebaker car from Hamilton to Ballarat. By 17 February 1936, he had managed to purchase a Fokker Universal passenger plane and flew it from Hamilton to Melbourne. This began what soon became an International Airline. The Museum is situated on Ballarat Road near Lake Hamilton and much memorabilia, including uniforms and a Fokker International aircraft are on display. The video-taped story includes both the rise and the eventual fall of Ansett Airways. The Burial Grounds at the South Hamilton Lutheran Cemetery contain many reminders of the area's early settlers and the hard work involved in their daily lives of building homes, clearing land, digging wells, experiencing fires and coping with various plagues. This Cemetery is well maintained and the stories of its deceased occupants have been widely researched by both local historians, such as Elizabeth Huf, in her book "Courage Patience and Persistence: 150 Years of German Settlement in Western Victoria" (3c) and by the many family historians and researchers in the process of establishing and describing their ancestral family trees and connections. 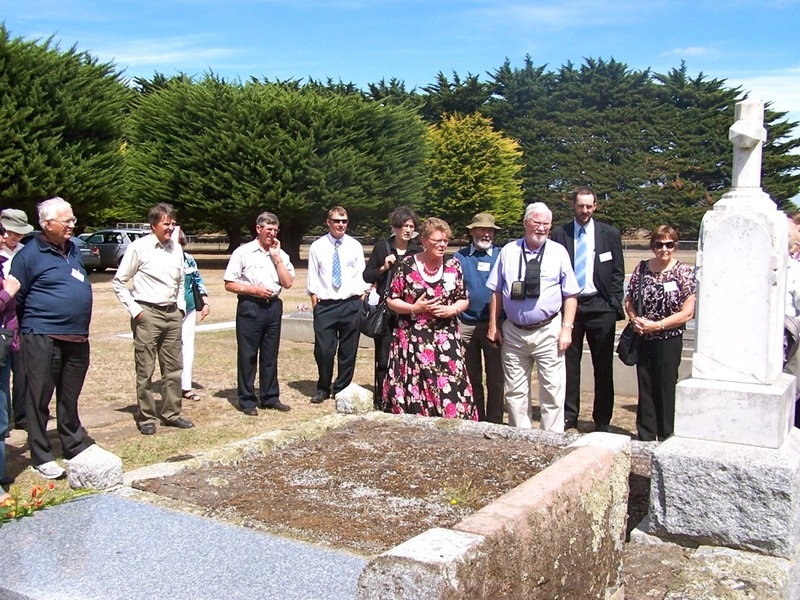 A special tribute was made to many of these ancestors during the course of the 1852 Wendish Wagon Trek from Rosenthal/Rosedale in South Australia to Hochkirch, now Tarrington in Victoria between 3 -7 May 2012. Descendants of each of these Trekking families laid floral wreaths on the graves of their ancestors. Churches were also important within the social life of the early settlers. St Michael's Lutheran Church was established on the grounds of the above cemetery but it later relocated eastwards to Hochkirch, now Tarrington and in 1858, its members erected their first church building on this new site. This was followed in 1863 by a larger blue-stone church with a bell tower. Some St Michael's members left this congregation and in 1857 formed St Luke's Lutheran Church. Foundation members were from such families as the Bienke, Bieske, Deutscher, Fiebig, Gerlach, Grieser, Huf, Petschel, Schneider and Zieschang families. The church building is now in interesting part of the Hamilton Pastoral Museum and its story and contribution to this area are well described by Coral Shepherd in the booklet, "St Luke's Lutheran Church 150th Anniversary" (2a). The Museum also features antique implements, wagons and many other items. This Tour also featured the letter "D", which was a fascinating Drive around Hamilton. Colin Huf showed us, while he was driving a local bus, various buildings erected as legacies to financially-contributing individuals and Good Shepherd College, which features agricultural studies on the large area of land surrounding this College. The re-vegetation undertaken on this property by Teachers there, such as Colin Huf, has been most commendable. Gratitude to the Tour Guides. Much planning and making of arrangement is required for such tours, so the tour participants are most grateful to both Colin and Betty Huf for helping to make this weekend a valuable experience. We also thank all others who contributed to the success of this 2012 Wendish Country Tour. Useful Sources of Information 1. Tour Notes, prepared by Betty Huf. 2. Booklets. [The Source number and letter are in brackets ( ).] (a) Tabor Lutheran Congregation, "Tabor Centenary 1853 to 1953". 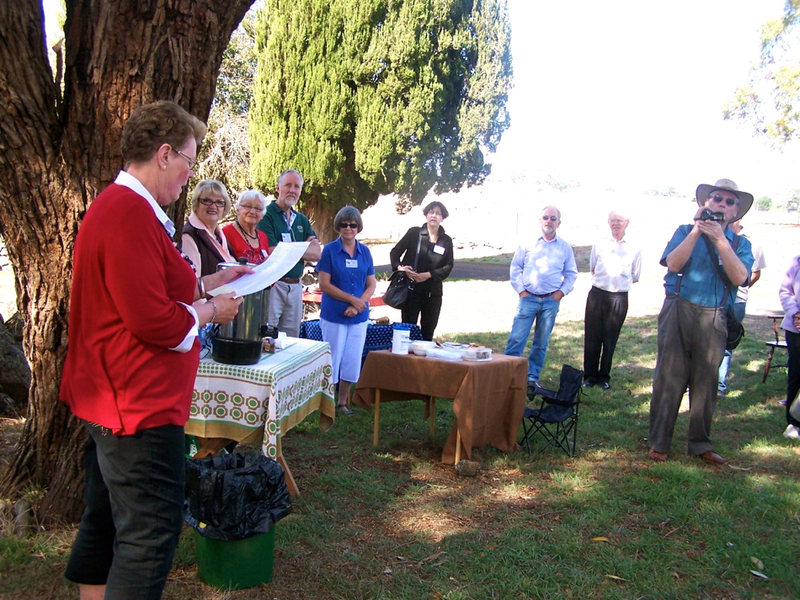 (b) Shepherd, Coral, Compiler, "St Luke's Lutheran Church 150th Anniversary, Hamilton Pastoral Museum", 2011. (c) Franz, Henricke, "German Heritage Places in Victoria Project", Volume 2: Inventory, November 1999. (d) Burger, Ray, "Burger Family History". 3. Books about Lutherans in Victoria. [The Source number and letter are in brackets.] (a) Brauer, A. "Under the Southern Cross", Lutheran Publishing House, Adelaide, 1965. (b) Hebart, Th. "The United Evangelical Lutheran Church in Australia", Lutheran Book Depot, North Adelaide, 1938. (c) Huf, Betty "Courage, Patience and Persistence: 150 Years of German Settlement in Western Victoria", St Michael's Lutheran Church, Tarrington, 2003. (d) Paech, W. H. "Twelve Decades of Grace", Lutheran Publishing House, Adelaide, 1974. (e) Weiss, J. Peter, "Short General and Statistical History of the Australian Lutheran Church". John Noack: Email: johnnoack@yahoo.com.au 120310_051.jpg Some of the Tabor Tour participants on the summit of Mount Rouse, near Penshurst. 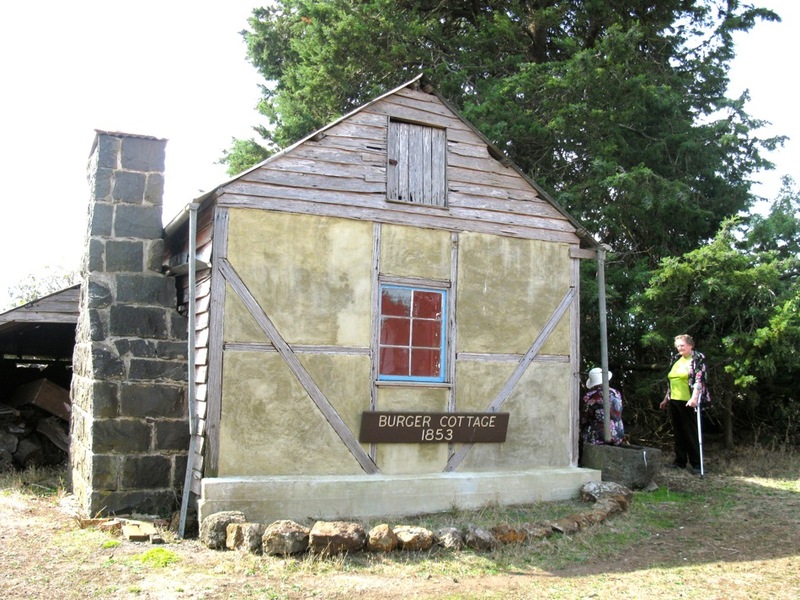 The Burger Cottage - the original home of the Burger family, and the oldest surviving Wendish building in Victoria. 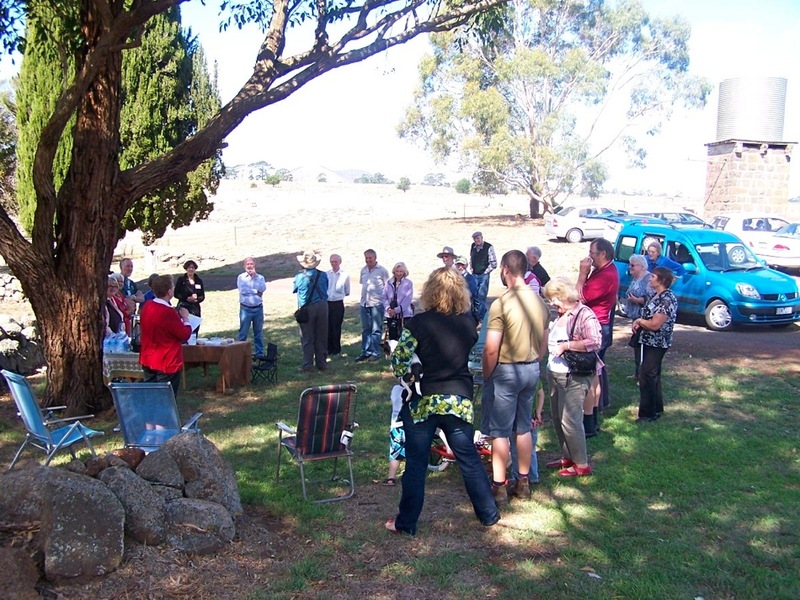 The annual Wendish Country Tour during Victoria’s long weekend in March allows our Society’s members and their friends to spend three days soaking up and learning about the various noteworthy historical and heritage sites in the area. 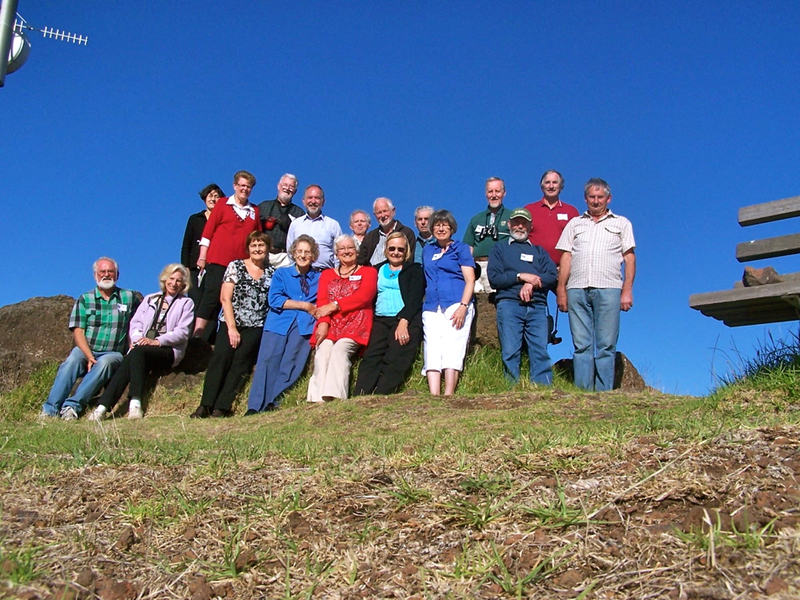 The Tabor Lutheran congregation celebrated the centenary of its church building at 10am on 11 March but before this event, tour participants were able to spend the Saturday at Penshurst climbing Mt Rouse and attending the Tabor concert; Sunday at Tabor and Gnadenthal and Monday touring Hamilton, including Good Shepherd College and the South Hamilton Cemetery. Our visit to Penshurst included an afternoon focusing on volcanoes. 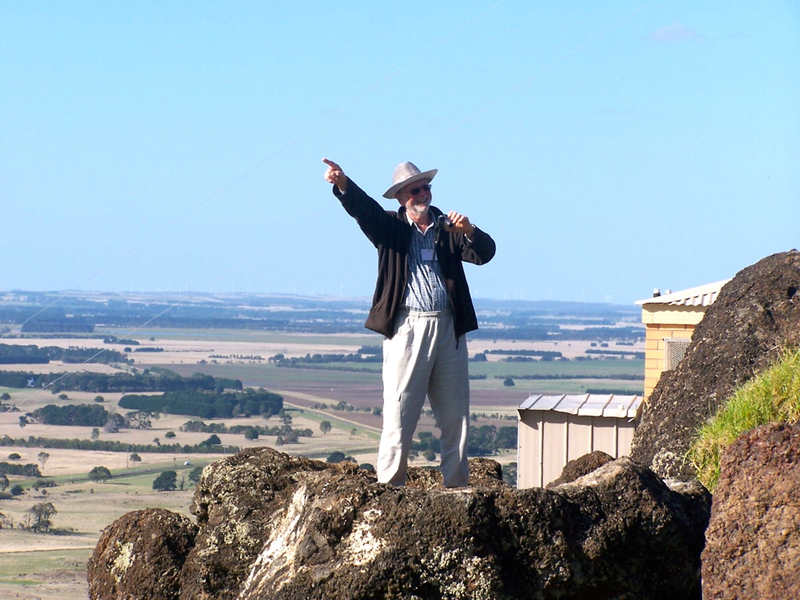 The Penshurst Volcanoes Discovery Centre is located in the former Mount Rouse Shire Offices and was opened in 2003 in order to inform people about this area’s former volcanic activity. We soon learned that Mt Rouse was formed by volcanic eruption about 350,000 years ago and that it expelled flowing larva, which later became bluestone and larva blown into the air, which became aerated scoria rock. Solid chunks of air-born larva are called bullets. Audio-visual presentations depicted clearly the large area affected by volcanic activity which is part of the Kanawinka Global Geo-park of South West Victoria and South East South Australia, stretching all the way from Millicent to Colac. Such a display of volcanic activity leads to the almost obligatory ascent of Mount Rouse, which is a massive accumulation of air-borne scoria which rises 100 metres above the surrounding volcanic plain. 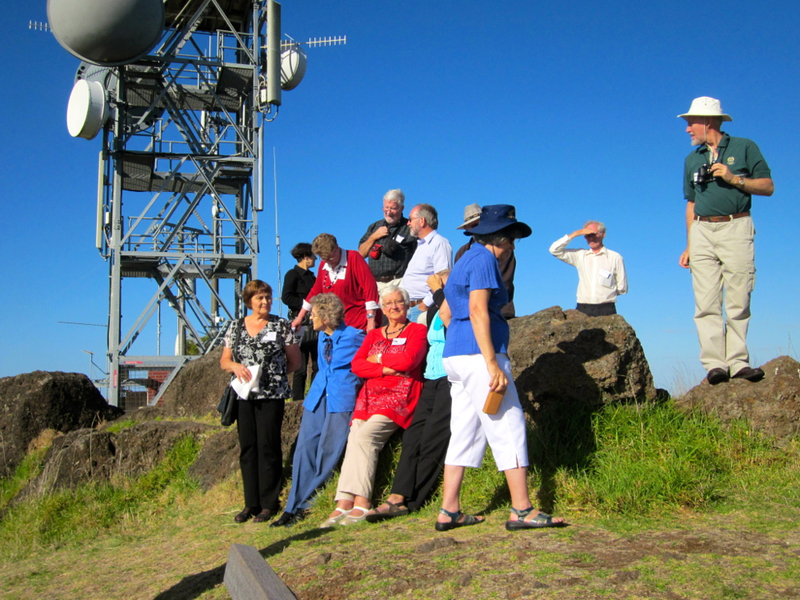 All of the touring party made it to the top and we took photographs to record this achievement. There was a good view of the surrounding landscape and the deep circular crater and lake rimmed with basalt. Photos were also taken of the volcanic layers of sediments, which have been exposed in the nearby Council quarry. Tabor’s Concert on Saturday evening at 8pm was held in the Church Hall. Trevor Linke welcomed everybody and the Tabor Talent for entertaining was revealed in the musical items presented by the Tabor Male Choir with its version of the famous “Schnitzelbank”, by Gavin and Tegan Fry and by others, as well as in the dramatic plays and skits relating to Basil the Rat, Two Hause Fraus and other items. The Centenary Service was held in the church at 10 am on Sunday 11 March, with Pastor Bill Fry as the liturgist, Dr Mike Semmler as the Preacher, Gavin Fry as the Organist and long-serving Vallance Huf as the Choir Conductor, along with others who took part in readings and playing musical instruments. The hymn before the sermon “For many years” was also sung at the building’s Dedication Service in 1912. The service booklet also contained photos of the church’s early stages of construction and the history of the three church buildings at Tabor. The first church was built on land bought from Johann Mibus and was dedicated by Pastor C.W.Schurmann in 1861. The second was dedicated on 10 July 1884 and is still standing. The third and present church was built according to plans prepared by Architect Mr Frank Hammond. Blue-stone rock was carted from Andreas Rentsch’s property and sand from Caroline Matuschka’s property. The freestone was brought from Mt Abrupt by bullock wagons. The Dedication took place on Thursday 7 March 1912 and the Pastors present were O Nichterlein, E. Kriewaldt, J. Darsow and Professor Koch. The building was designed in the 13th century English Gothic Style and a noteworthy feature is its stained glass windows depicting Peter, Paul and Christ as the Light of the World, based on the famous painting by Holman Hunt. Some Members financed and presented various items of furniture and utensils. This Centenary Celebration is clear evidence of Tabor’s respect and concern for its traditions and its pioneering heritage, which included such early Germanic and Wendish families as Gardi, Lehrack, Matuschka, Mudra, Nowotna, Rentsch, Scheetz, Starick, and Zschech. The touring party, which had come to Tabor on the bus, continued on to Gnadenthal and its well kept cemetery and grave-sites. This area was located between the township of Penshurst in the East, where the families could purchase their required house-hold goods and the church at Tabor in the West, where they could attend church services after using their homes for services until 1861. This area’s pioneering families included the Alberts, Bieschkes, Burgers, Mirtschins, Stephans and Urbans. Some local Gnadenthal farms were the next destination. The Mirtschins displayed for us their very old wooden trunk and wooden wheelbarrow and the Burgers made us welcome at their 1853 Burger Cottage, which contains family items and books used back in the pioneering days. Tours through Europe are often called “ABC Tours”, because they feature either “Another Beautiful Cathedral” or in a less complimentary description, “Another B…. Castle”. Hamilton also has its own “ABC Tour”: Ansett Airways Museum, a Burial Ground of great historical interest and the Churches of St Michael’s and St Luke’s, which reveal much about the experiences of this area’s early pioneering settlers. Ansett Airways, which began its story when Reginald Ansett, on 5 Dec 1931, drove his Studebaker car from Hamilton to Ballarat. By 17 February 1936, he had managed to purchase a Fokker Universal passenger plane and flew it from Hamilton to Melbourne. This began what soon became an International Airline. The Museum is situated on Ballarat Road near Lake Hamilton and much memorabilia, including uniforms and a Fokker International aircraft are on display. The video-taped story includes both the rise and the eventual fall of Ansett Airways. The Burial Grounds at the South Hamilton Lutheran Cemetery contain many reminders of the area’s early settlers and the hard work involved in their daily lives of building homes, clearing land, digging wells, experiencing fires and coping with various plagues. This Cemetery is well maintained and the stories of its deceased occupants have been widely researched by both local historians, such as Elizabeth Huf, in her book “Courage Patience and Persistence: 150 Years of German Settlement in Western Victoria” (3c) and by the many family historians and researchers in the process of establishing and describing their ancestral family trees and connections. 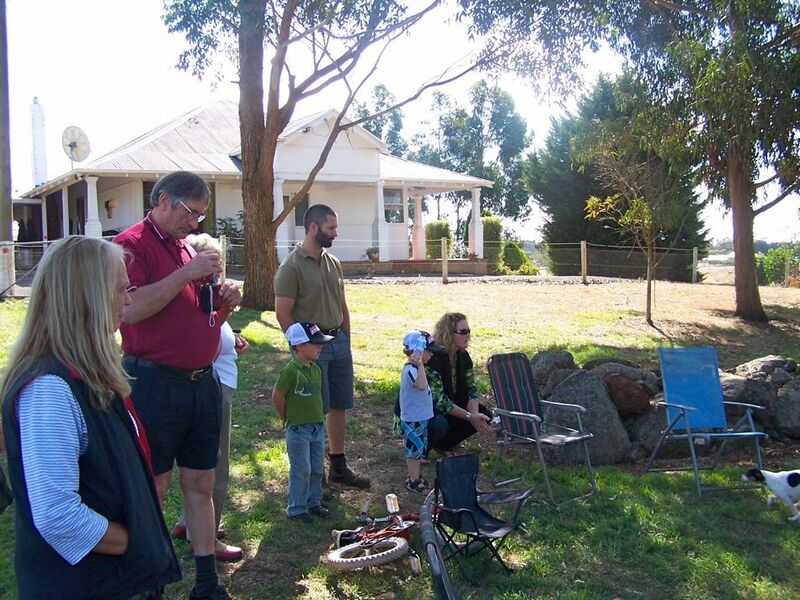 A special tribute was made to many of these ancestors during the course of the 1852 Wendish Wagon Trek from Rosenthal/Rosedale in South Australia to Hochkirch, now Tarrington in Victoria between 3 -7 May 2012. Descendants of each of these Trekking families laid floral wreaths on the graves of their ancestors. Churches were also important within the social life of the early settlers. St Michael’s Lutheran Church was established on the grounds of the above cemetery but it later relocated eastwards to Hochkirch, now Tarrington and in 1858, its members erected their first church building on this new site. This was followed in 1863 by a larger blue-stone church with a bell tower. Some St Michael’s members left this congregation and in 1857 formed St Luke’s Lutheran Church. Foundation members were from such families as the Bienke, Bieske, Deutscher, Fiebig, Gerlach, Grieser, Huf, Petschel, Schneider and Zieschang families. The church building is now in interesting part of the Hamilton Pastoral Museum and its story and contribution to this area are well described by Coral Shepherd in the booklet, “St Luke’s Lutheran Church 150th Anniversary” (2a). The Museum also features antique implements, wagons and many other items. This Tour also featured the letter “D”, which was a fascinating Drive around Hamilton. Colin Huf showed us, while he was driving a local bus, various buildings erected as legacies to financially-contributing individuals and Good Shepherd College, which features agricultural studies on the large area of land surrounding this College. The re-vegetation undertaken on this property by Teachers there, such as Colin Huf, has been most commendable. Much planning and making of arrangement is required for such tours, so the tour participants are most grateful to both Colin and Betty Huf for helping to make this weekend a valuable experience. We also thank all others who contributed to the success of this 2012 Wendish Country Tour. 1. Tour Notes, prepared by Betty Huf. (a) Tabor Lutheran Congregation, “Tabor Centenary 1853 to 1953”. (b) Shepherd, Coral, Compiler, “St Luke’s Lutheran Church 150th Anniversary, Hamilton Pastoral Museum”, 2011. (c) Franz, Henricke, “German Heritage Places in Victoria Project”, Volume 2: Inventory, November 1999. (d) Burger, Ray, “Burger Family History”. (a) Brauer, A. “Under the Southern Cross”, Lutheran Publishing House, Adelaide, 1965. (b) Hebart, Th. “The United Evangelical Lutheran Church in Australia”, Lutheran Book Depot, North Adelaide, 1938. (c) Huf, Betty “Courage, Patience and Persistence: 150 Years of German Settlement in Western Victoria”, St Michael’s Lutheran Church, Tarrington, 2003. (d) Paech, W. H. “Twelve Decades of Grace”, Lutheran Publishing House, Adelaide, 1974. (e) Weiss, J. Peter, “Short General and Statistical History of the Australian Lutheran Church”.